This seven night holiday starts with 2 nights in the UNESCO recognised World Heritage city of Regensburg, famous for its beautiful 13th century Gothic cathedral, the oldest boy's cathedral choir in the world and also the longest continually serving sausage kitchen in the world (since the 12th century and still serving around 6,000 sausages a day!). It's well worth spending time strolling around Regensburg to discover this Bavarian gem. Bavaria, as a region, is simply stunning - criss-crossed by beautiful rivers that meander through deep valleys and contrasting dark Alpine forest, pretty towns and villages are home to quaint traditional inns and eateries, and onion-domed church towers peep above lush green meadows. This walking holiday takes you on a stunning journey, following the well-marked Jurasteig path, through the rich Bavarian countryside, covering riverside paths, flowering meadows, and pine-scented forests. Your walk follows the Altmuhl river with its steep valleys rich with castles and pretty towns, crossing Europe's longest wooden bridge to arrive at the confluence with the mighty Danube. 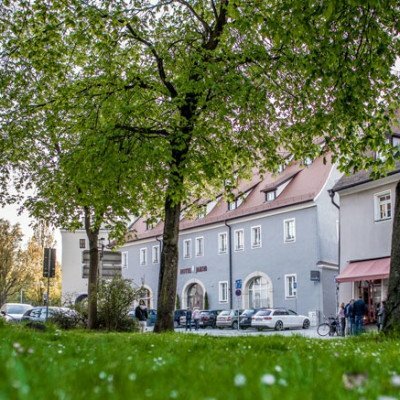 After visiting the spa town of Bad Abbach, you'll leave the Danube behind and climb into the lower German Jura Mountains to arrive at Eilsbrunn, finishing at the world's oldest inn. En route you'll marvel at the fascinating flora and fauna: eagles and hawks swoop overhead, whilst deer and wild boar roam the forests. A mix of northern European and Mediterranean flora lines the route and springtime brings out an abundance of flowers. Later in the year, a mix of fruit and grapes come in to season. Traditional German favourites - bratwurst and beer - are on most menus along the way but you'll also find fresh foods made using the local produce from fresh seasonal vegetables to superb grilled meats. Look out for the local pasta, Spatzle, served with a rich cheese sauce and deep fried onions. Arrive in medieval UNESCO World Heritage Regensburg and maybe head to a local beer garden for dinner. Today, discover the delights of medieval UNESCO World Heritage Regensburg. stroll around the narrow cobbled streets to discover the Dom, the 13th century Gothic cathedral of St Peter, founded in 1275, with it's famous boys choir - the Regensburger Domspatzen (literally 'cathedral sparrows'), the world's oldest boys choir that dates back as far as 975AD. Other sights include the 12th century stone bridge, used by the 2nd and 3rd crusades to cross the Danube, the 12th century Romanesque Basilica of St James, the botanical gardens of the University of regensburg and the famous riverside sausage kitchen. Located right next to the Danube this remarkable little restaurant has been open for business since the 12th century and with queues normally coming out of the door, they serve in the region of 6,000 sausages a day! Today's route leads over the slopes at the side of the Altmuhl to the enchanting rocky compound of the Klamm nature reserve (gorge). On its highest point you have a most impressive view of the castle of Prunn on the opposite side. Crossing the bridge across the Altmuhl near Einthal you'll reach the other side of the river, where the trail leads up to the castle of Prunn and an inn of the same name. You are rewarded for the strenuous ascent with a spectacular view of the Altmuhl valley. Continuing, with a view of the massive Jura walls above Essing, you cross the Altmuhl for a last time on one of the longest wooden bridges in Europe, the so-called Tatzlwurm (winged dragon). Soon, you reach the ascent to the Keltenwall (Celts' rampart) which leads over the hill down into the valley of the Danube. Kelheim sits in the confluence of the Danube and Altmuhl rivers. You can wander around the pleasant town or take a boat trip along the Danube to the C7 Benedictine abbey Kloster Weltenburg. 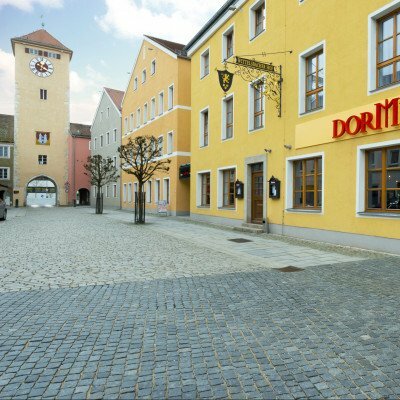 Complete with its own brewery and brewery museum, from here you can walk back on a lovely route passing the Weltenburger Enge, or take the boat back. Alternatively, take a trip up to the Hall of Liberation (Befreiungshalle) of King Ludwig I or to the Archeological Museum. The Jurasteig trail leads up to the Goldberg. Shortly before you reach Kapfelberg, there is a gorgeous view over the Danube valley with the Devil's Rock (Teufelsfelsen) near Bad Abbach, before the Jurasteig crosses the Danube near Poikam to the river's other side. 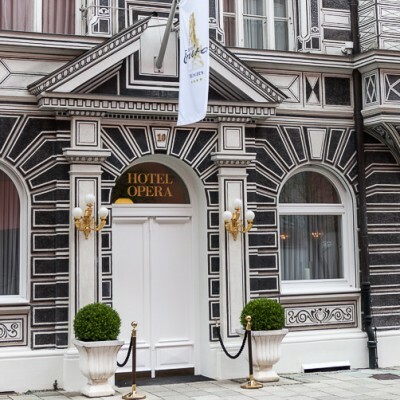 The route follows a scenic pathway through an idyllic sloping forest directly into the spa park, where in former times Emperor Charles V bathed in the salubrious waters of Bad Abbach. Maybe take a spa to refresh the muscles from the previous days or relax in the lovely park. There are a series of well-marked circular trails you can follow, including an easy path along the Danube. You can also take the local bus to Regensburg to spend the day there. Today you follow the idyllic Danube shores to the pedestrian bridge north of Bad Abbach, after which the Jurasteig follows the route through the nature preserve of the slopes above Oberndorf. The route ascends through the settlement of Kalkofenring, following a changing woody landscape with beautiful views of the Danube valley. In Matting, a cable ferry boat takes you to the other side of the Danube. With its steep rocky walls, the nature preserve of the slopes of Mattinger Hange offers impressive scenery and the opportunity to watch the peregrine falcon hunt. On top of the slope, a pathway leads to a marvellous viewpoint that offers a last outlook over the Danube valley. Passing the Zuylen chapel, you will reach Alling in the valley of the Schwarze Laber. Scenic beech forests nature trails lead to Eilsbrunn, and after having a beer in the world's oldest inn (closed Tuesdays) you take a bus back to Regensburg for your last night. 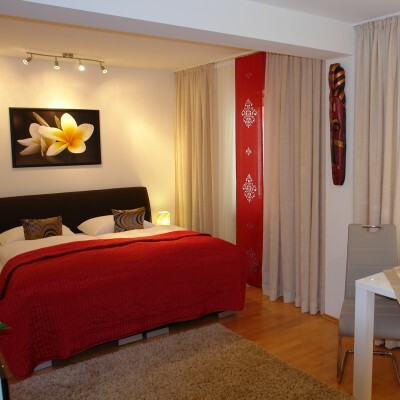 The Parkresidenz is an aparthotel offering well decorated rooms with separate sitting areas. The rooms are of a good size and have balcony or a terrace. Breakfast, weather allowing, can be served in the nice garden. Frau Ritter will make you feel at home with her warm and friendly welcome. The junior suite offers a separate living area and a terrace to the garden. Every two days from 16th May 2019 to 13th Oct 2019, for 7 nights. All dates are subject to availability, please contact us to check.